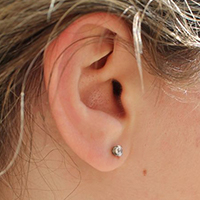 A pair of earlobe piercings for ages 10-17. Both piercers will pierce simultaneously for a faster, easier experience. Limited availability. Please read our FAQ on minors for required paperwork.